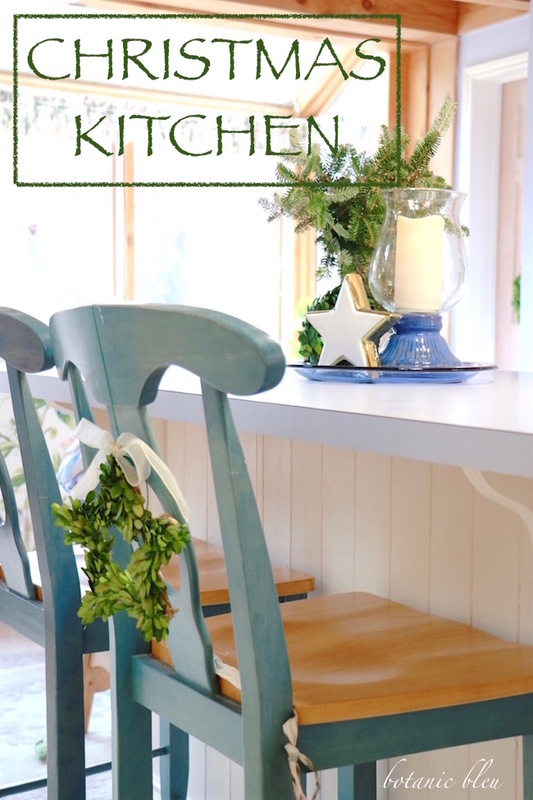 Christmas Day finds most kitchens filled with good food, laughter, and love. Our beef in the slow cooker (thank you, Yvonne of StoneGable, for the recipe) is ready, potatoes are boiling to make mashed potatoes, and fresh green beans are waiting for final preparation. During the holidays everything seems to be going according to plans, then... out of left field (or the North Pole) comes another idea. One you had not planned. Or you think you had not planned. One that just happens. A magical Christmas moment. Could it be the tree has been in the wings for years, just waiting to fly? 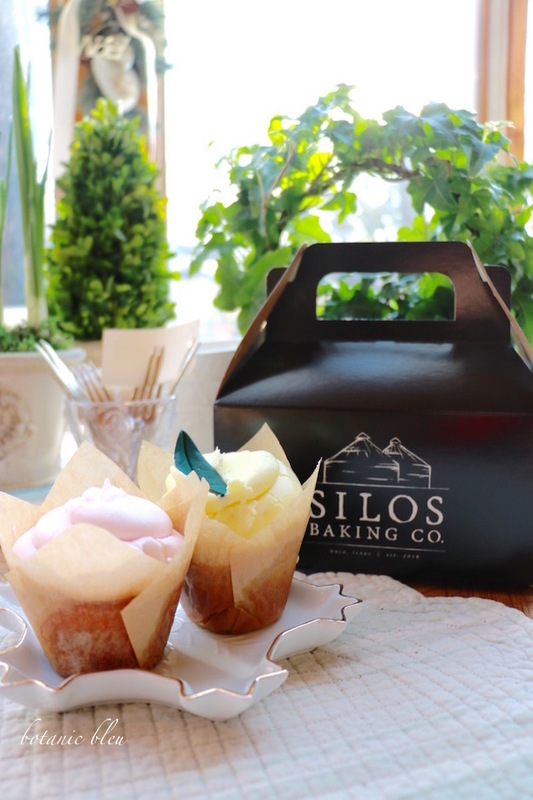 Have you heard about the Silos Baking Co. in Waco, Texas? You know, the bakery that is part of Joanna and Chip Gaines Magnolia company? 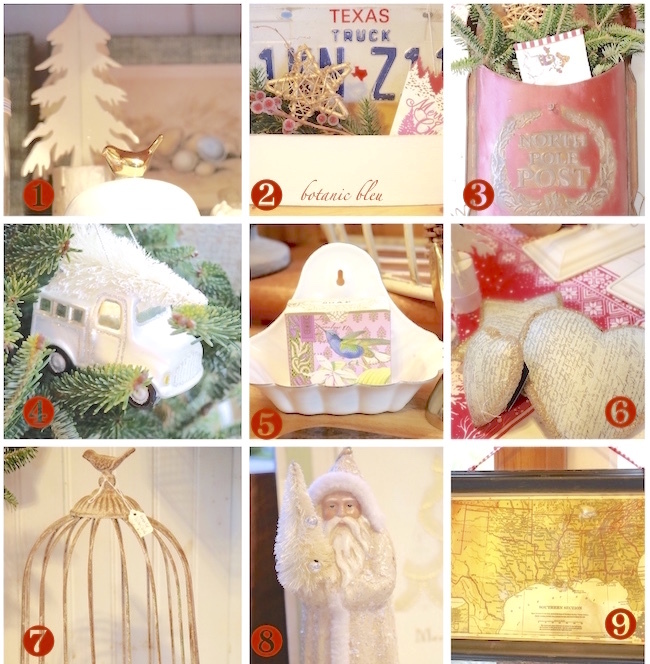 If you are a Fixer Upper fan, you probably know that Joanna L O V E S cupcakes, and her Silos Baking Co. sells her favorites. 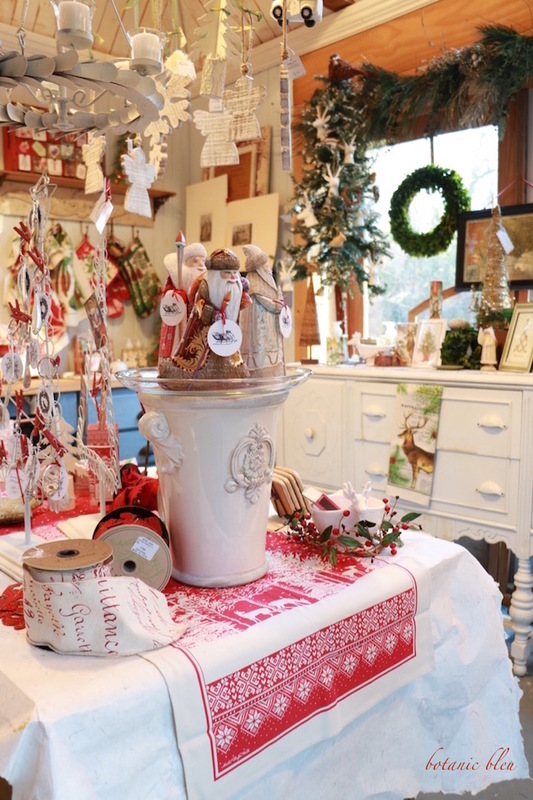 The second week in December, a small group of us traveled to Waco to see the Magnolia store all decked out in its Christmas finery for a little Christmas shopping. 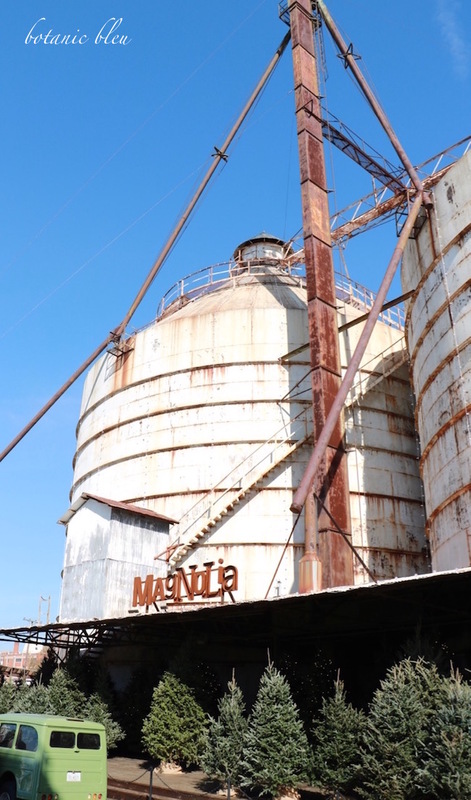 Waco is about 80 minutes south of my house, and a day trip is an easy drive with plenty of time for shopping before heading back home. 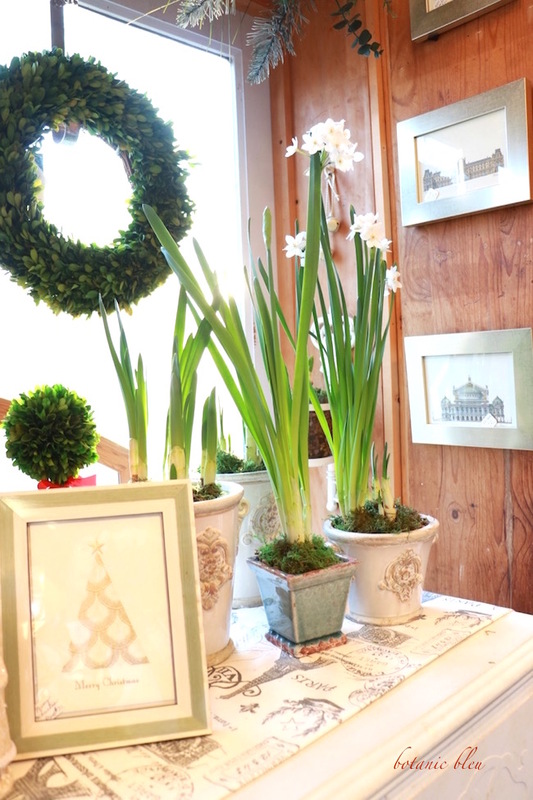 White flowers are among my favorite winter flowers with which to decorate. 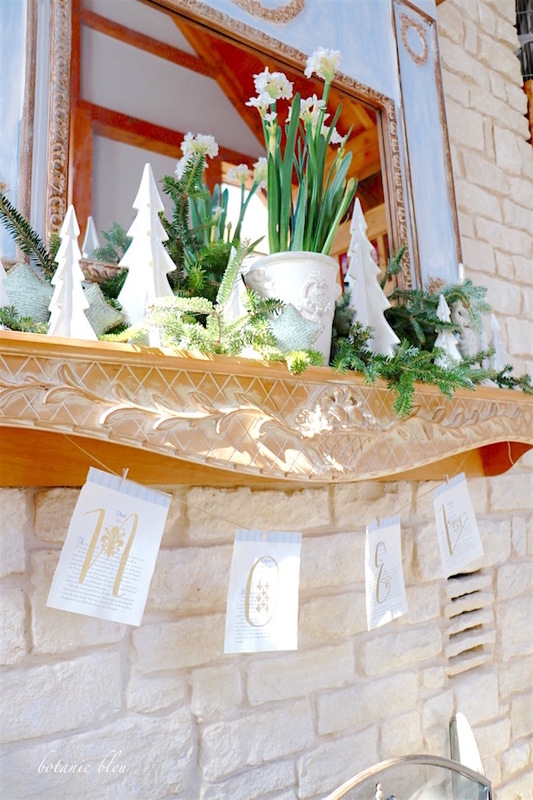 White poinsettias, white paperwhites, and white amaryllis are all beautiful as part of Christmas decorations anywhere, but especially in the living room before the white stone fireplace. One thing I look at when choosing poinsettias is the center of the colored leaves where the actual flowers are located. The brightly colored leaves are modified leaves, and the tiny buds in the center are the real flowers. 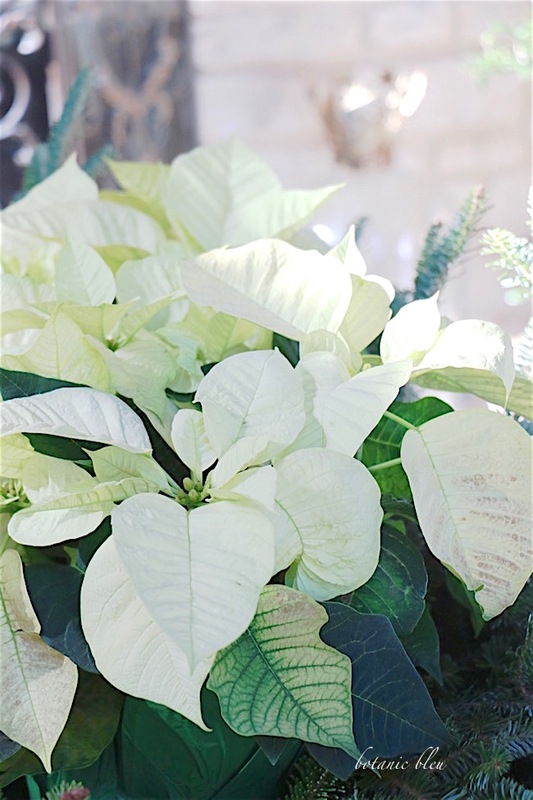 I choose plants in which the tiny center flowers are tightly closed in order for poinsettias to last longer. Just so you know, I refer to the modified colored leaves as blooms like most people. 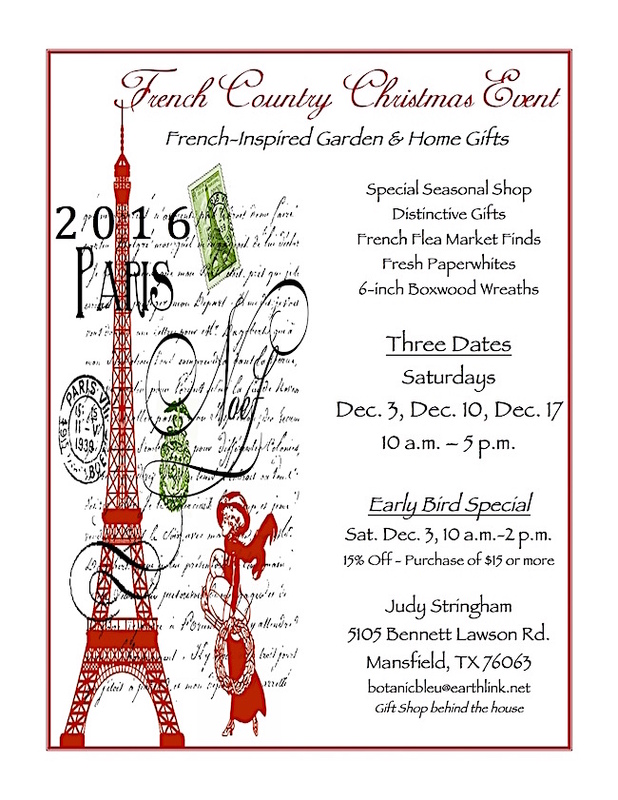 What is for sale in the sixth annual French Country Christmas Market? 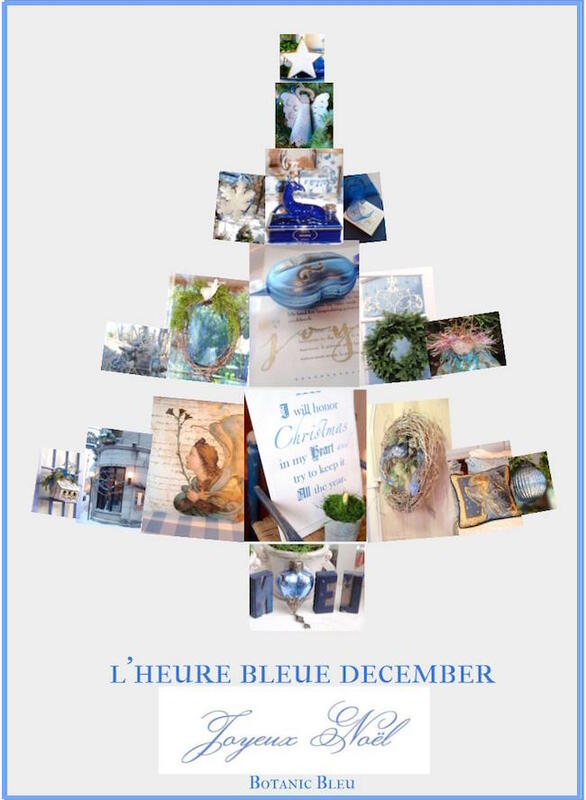 Each year I get excited about all the beautiful, fun things I find for the Christmas Market Event in the garden shed behind my house, and want to share them with you who read Botanic Bleu, but cannot attend the Christmas sale. Plus, those who will be able to come on December 10 or 17, the following will give you an idea of what's in the shop and where it is located. 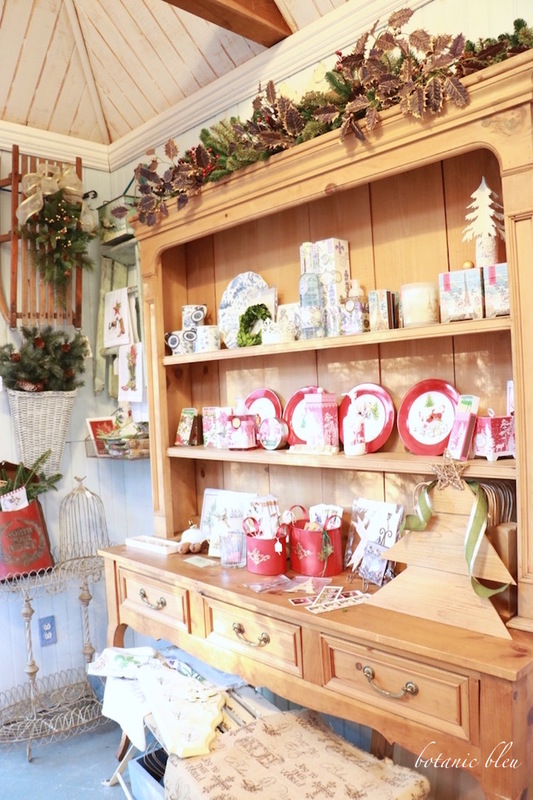 When you enter the garden house shop, here is the overview of what you see. Pretty overwhelming until you take a look at each section by itself. So, we are going to take a tour of the shop by the way the shop is laid out. 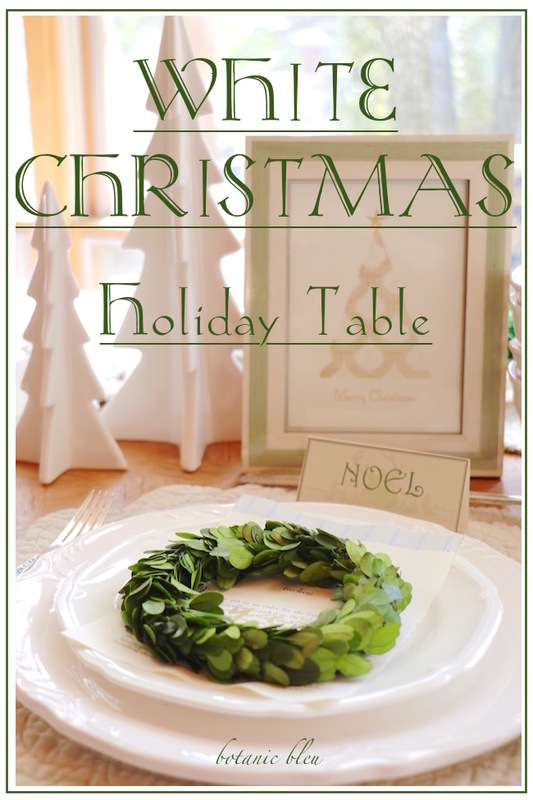 The table in the center of the room always sets the overall look each Christmas. 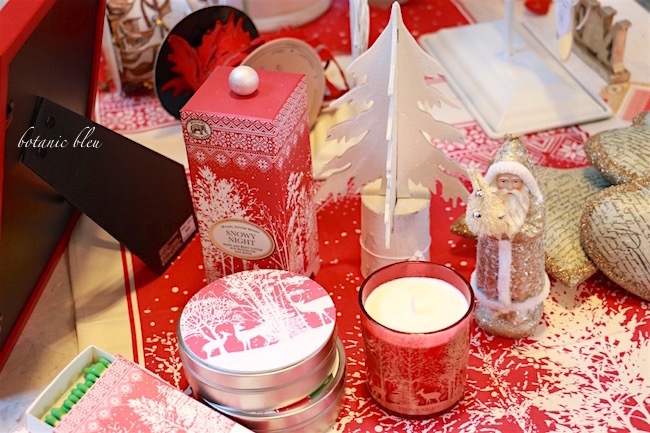 This year it is all about red and white which was determined by the gorgeous Michel Design pattern called Snowy Night. The red and white runner on the table is actually two kitchen cotton towels in the Snowy Night pattern placed end to end. 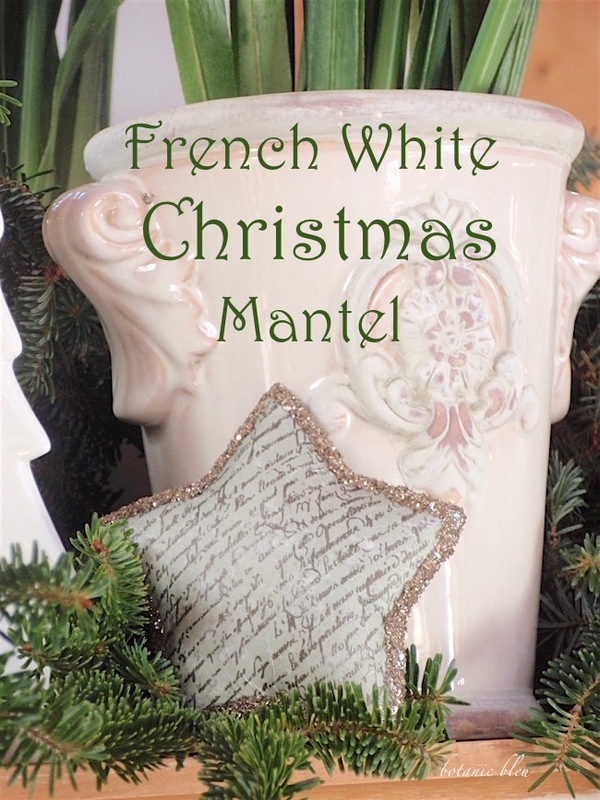 The large French-style pot is one of three sizes available. Watch for this pot in different places around the shop. The hand-carved wooden Russian Santas were found this September at the Maison Objet Paris International Trade Show. Each year I try to find at least one very special item to offer that takes center stage on the table. Two of the four Santas are signed by the artist who carved and hand-painted them. 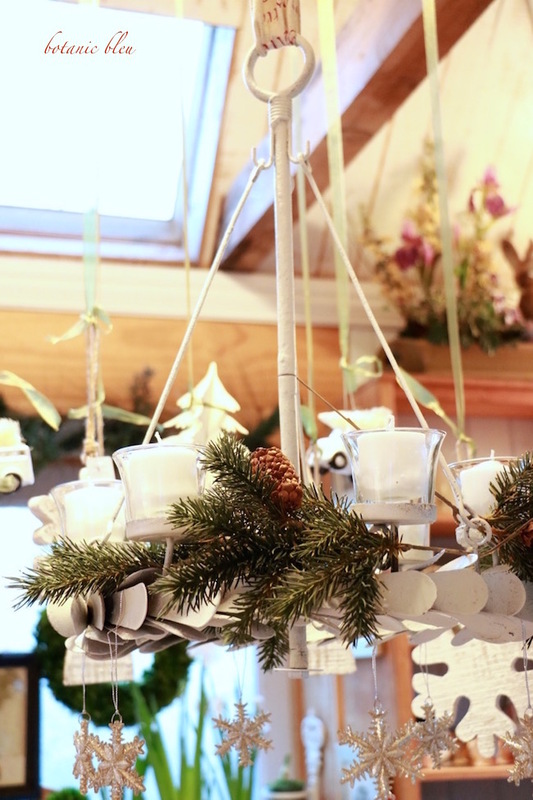 The second very special item this year is the hanging white metal candelabra. Red and natural French script fabric ribbon suspends the candelabra above the table in the middle of the room. The candelabra is versatile. A base comes with it that allows the candelabra to sit on a table as another way to use the candelabra. 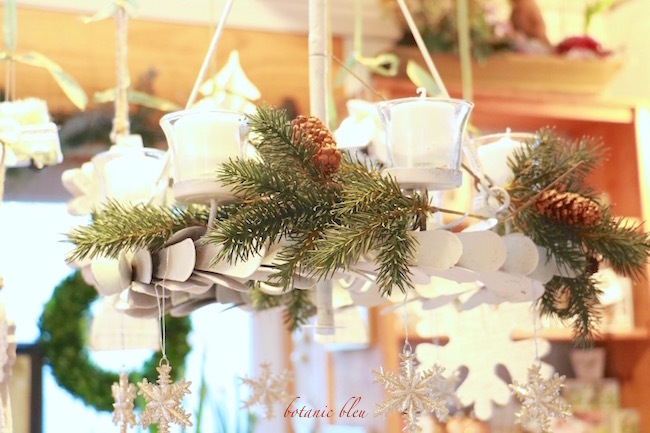 Perfect for using on outside tables that do not have a place to hang a candelabra. I love hanging it which allows glittery snowflake ornaments to dangle from it. 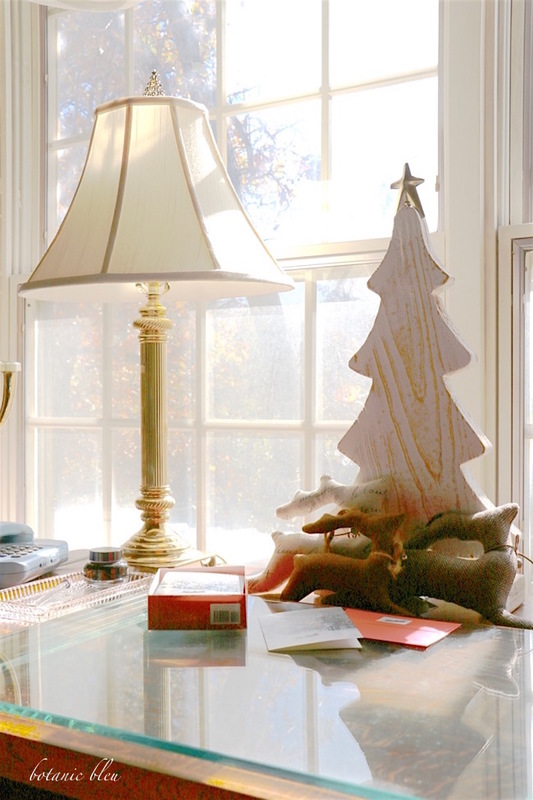 On the table, a white deer bowl that can be used for soup, candy, or as a counter catch-all for keys holds a box of matches in the Snowy White design. 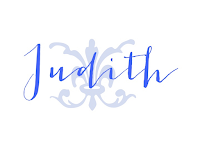 The Snowy White collection has so many beautiful things in it. 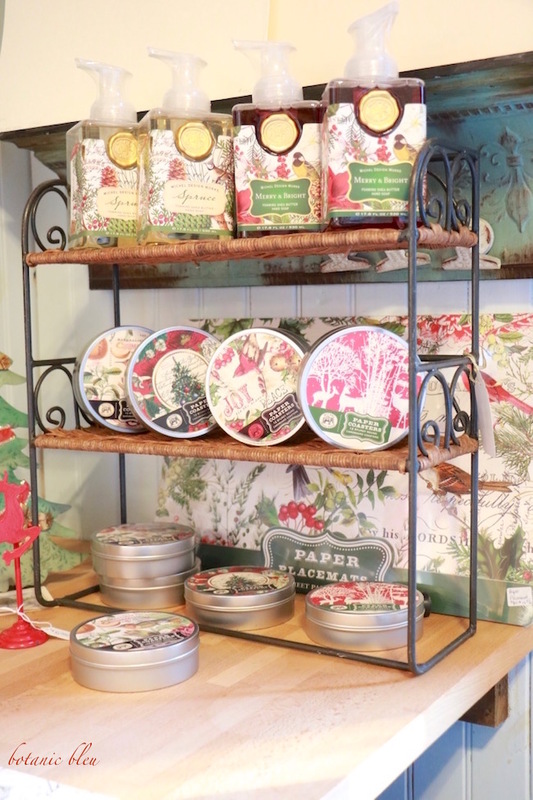 Lotion, long-burning soy candles, and paper coasters in a decorator tin sit on a cotton kitchen towel. The matches have green heads to complement the red and white box design. The candle comes in a decorator keepsake box, too. 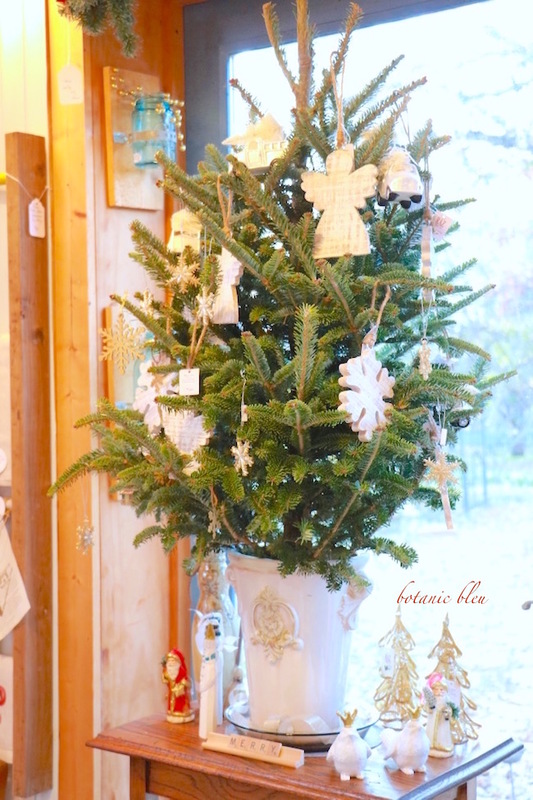 The little white glitter trees are natural wood with rustic wood trunks for their bases. 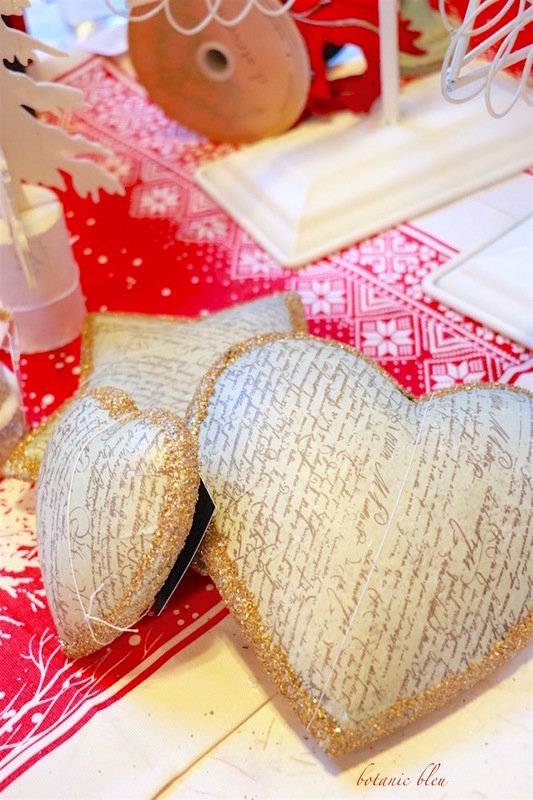 Script papier mâché ornaments come in two sizes and two styles, hearts and stars. I call the script French, but I am not sure if it really is. Does not matter to me. These look wonderful with fresh greenery and add a little French inspiration. 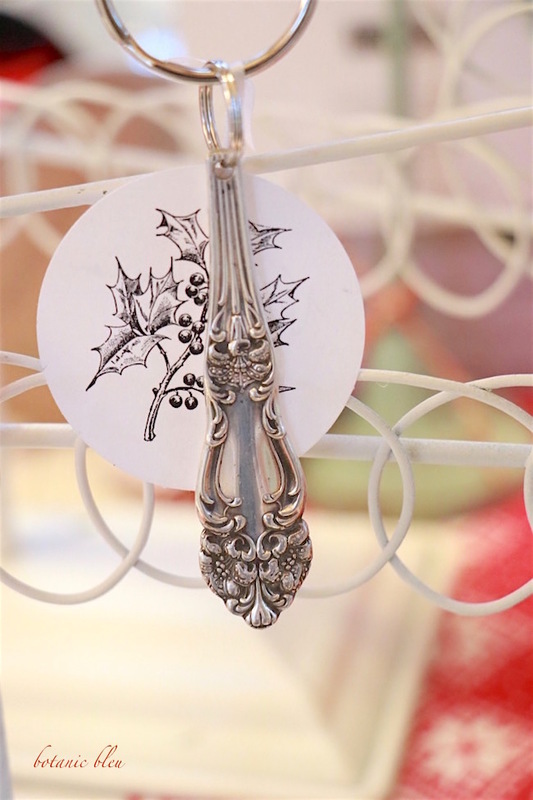 Vintage silverplate fork handles are elegant key rings and make beautiful stocking stuffers. 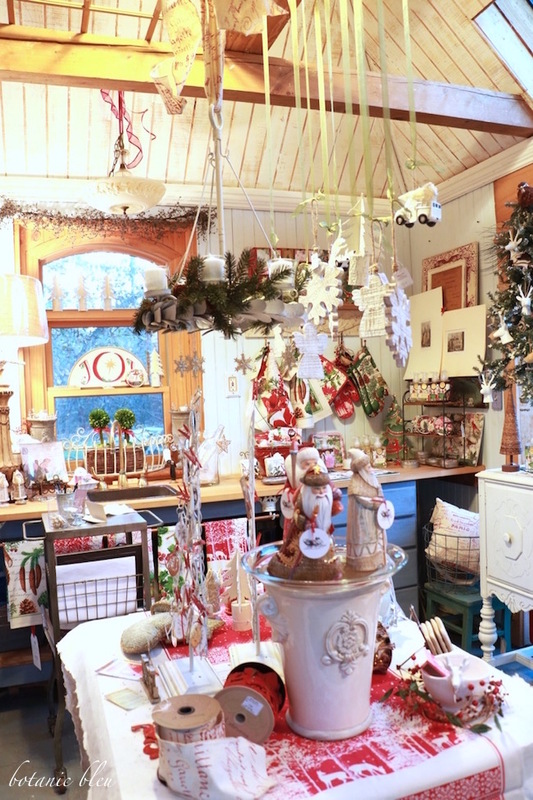 I buy lots of nice generic ribbons at discount stores for wrapping packages, but watch for speciality ribbons to offer in the French Country Christmas Event each Christmas. Brown fabric deer make an unusual napkin ring. Ivory and red fabric reindeer ribbons have a tiny bells that actually ring. 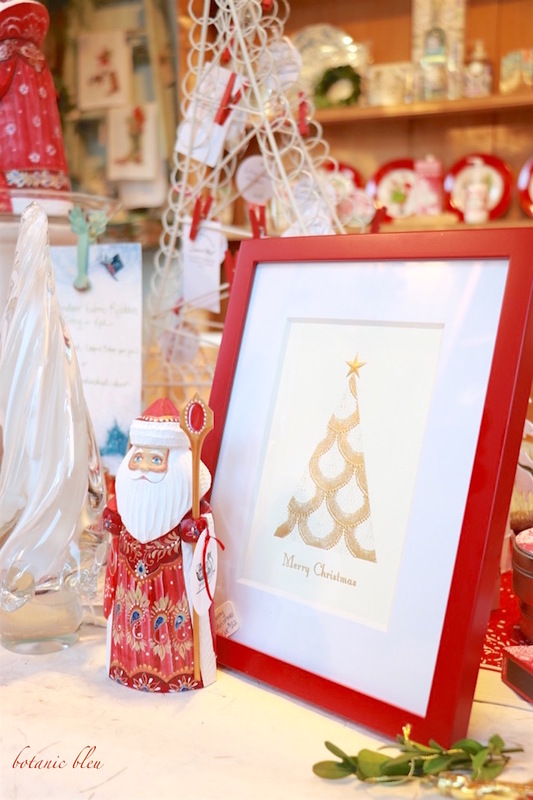 They are perfect for gift package decorations, tree ornaments, and for decorating napkins, table runners and pillows. 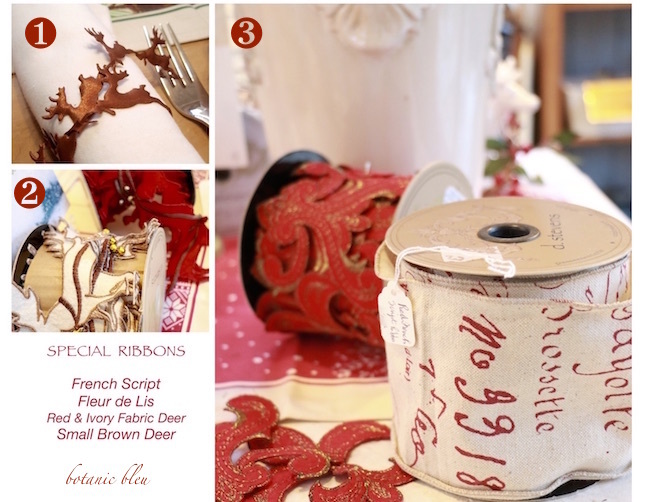 Red fabric cut-out ribbon has two French-style patterns that can be used in the same ways as the reindeer ribbons. 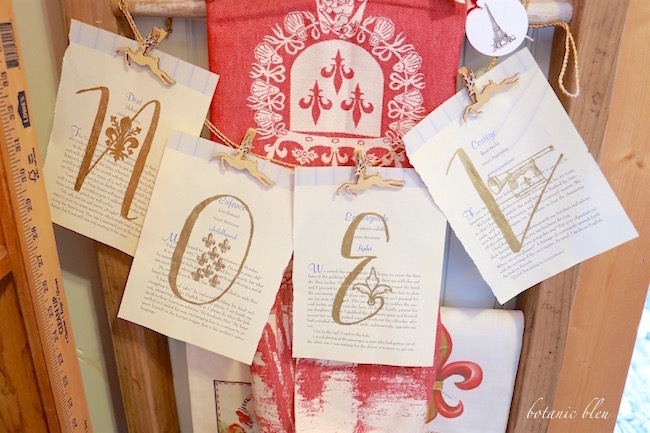 The red and natural canvas French-script ribbon is strong enough to hold the hanging candelabra. Wouldn't it be beautiful as a garland on a Christmas tree? 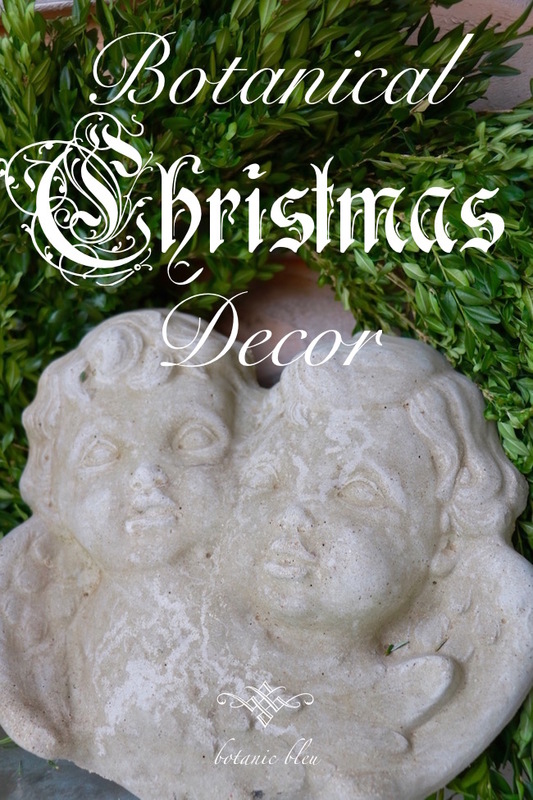 White-washed wooden snowflake and angel ornaments come in two sizes. Trucks carrying Christmas trees are all across the internet from vintage toys as table decor, painted ones on pillow covers, and art prints. 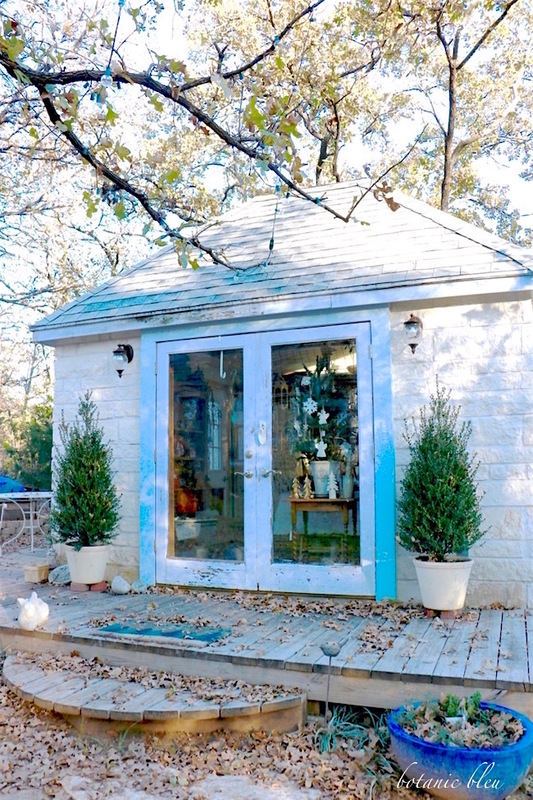 When I found these adorable white glass trucks with campers carrying white bottle brush trees, I did not have to think twice about ordering them for the garden shed shop. 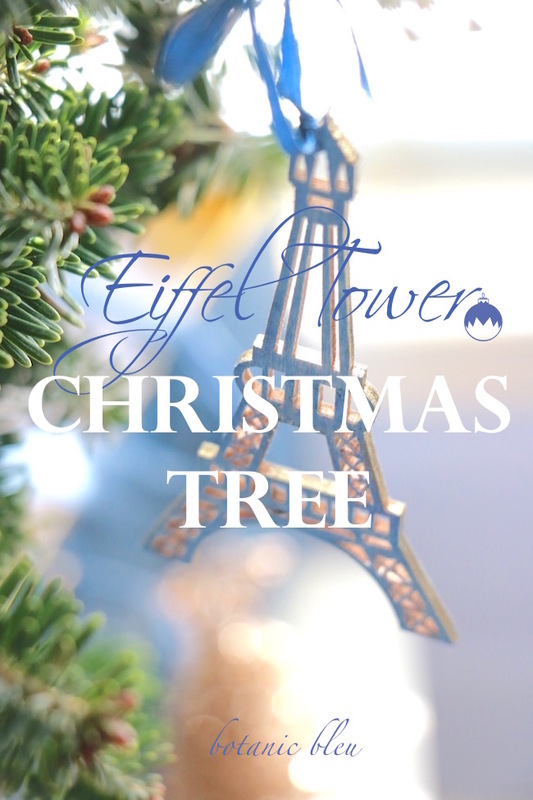 Moving from the central table area is the real Fraiser fir tree in one of the large French-style ceramic pots as a tree holder. On the wall next to the live tree is a rustic towel holder made from an old broom handle, an oak dowel, and weathered redwood 2x3 boards. It holds towels from France. The top two rungs hold vintage French kitchen towels found at Paris flea markets this September. 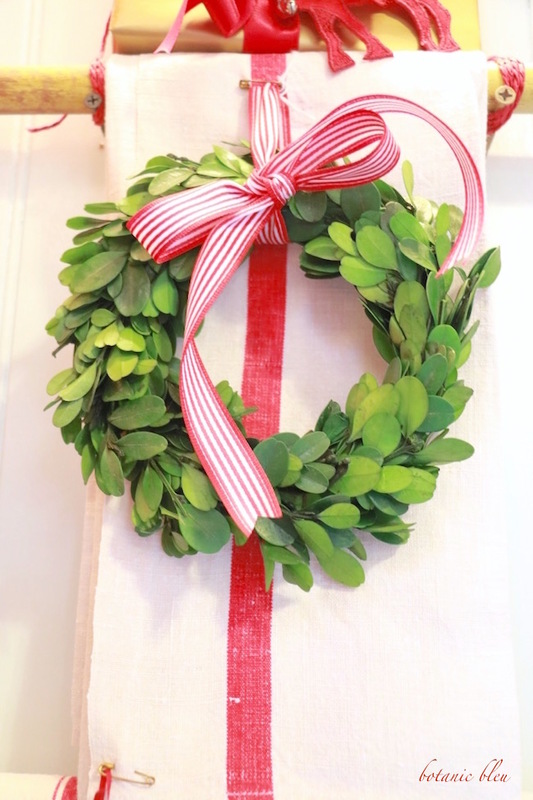 The 6" preserved boxwood wreaths make them look so Christmas-y. The red and white towel with the upside down fleur de lis has an image of Chateau Chenonceau. Found at Chenonceau this fall, the towel is new. 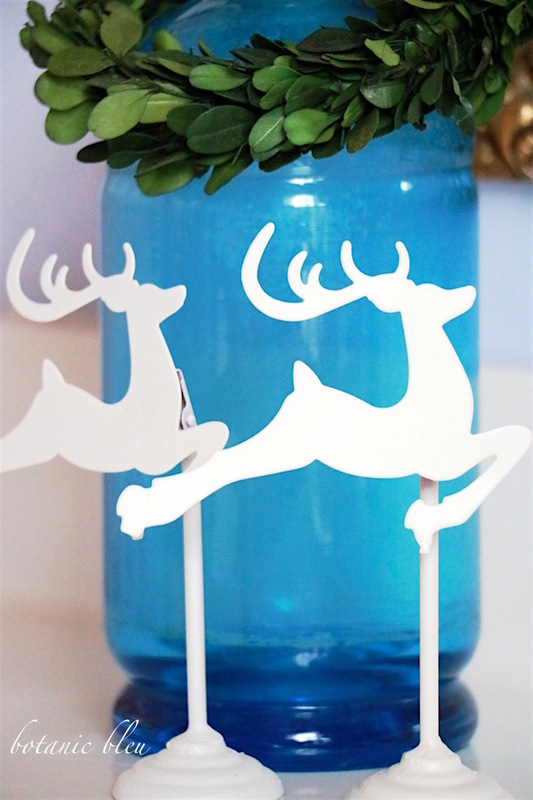 Wooden deer clips with glittered antlers and hooves hold the hand-painted golden NOEL banner. My grandmother's buffet that sits in front of the second set of French doors holds fresh paperwhites on one end. Small and medium sized French-style ceramic pots hold 3-4 bulbs each. 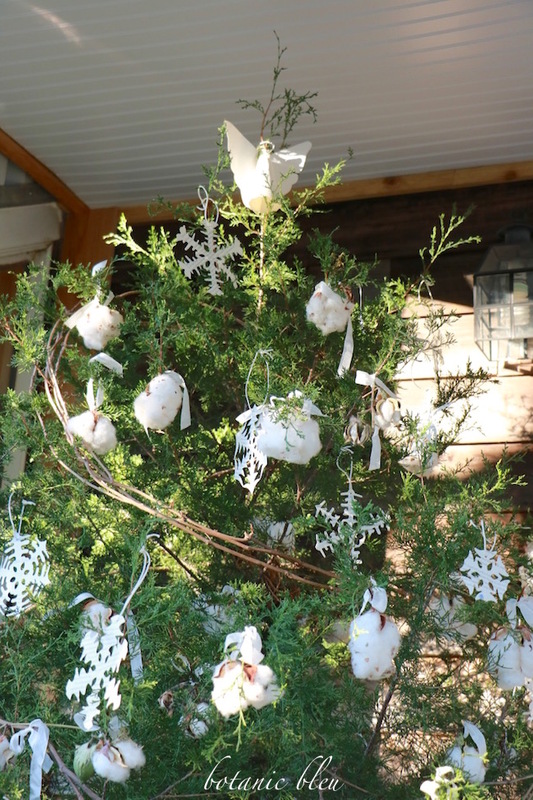 The other end of the buffet holds a faux Christmas tree laden with white ceramic deer and hand-carved bird ornaments. 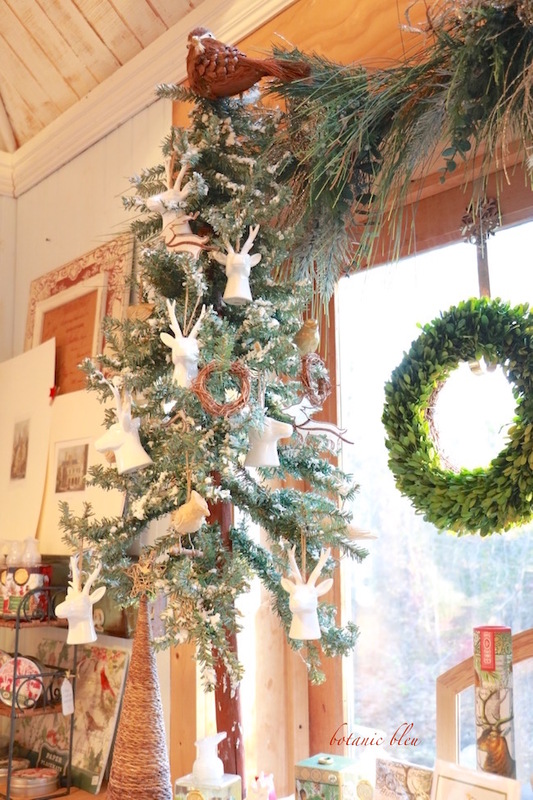 A smattering of small grapevine wreaths and ivory fabric deer ribbons also decorate the tree that is good for a masculine area such as a home office or a teen-aged boy's room. The counter on the back wall is for kitchen linens and accessories. Kitchen towels, pot holders, and oven mitts are available in a variety of designs that coordinate with bottles of foaming soap, paper plates, paper placemats, paper napkins, and sets of resin coasters. 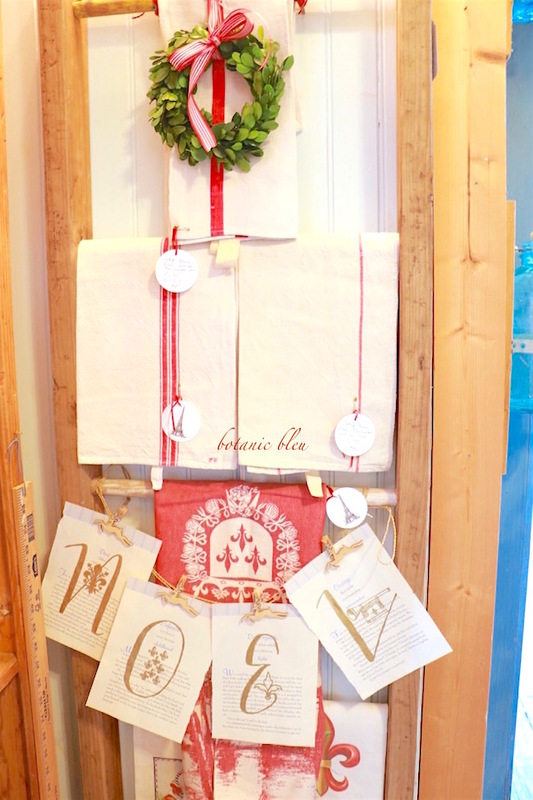 Foaming soaps, paper coasters, and paper placemats coordinate with the Michel Design towels making it easy to give a small gift or a larger gift by including several coordinating items in a gift basket. 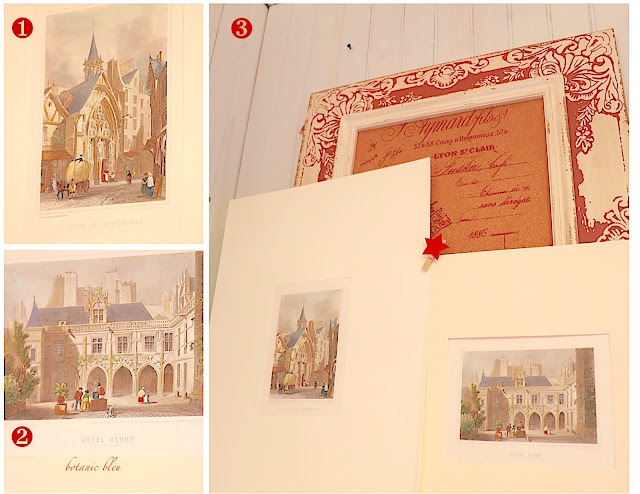 The wall above the foam soaps displays two vintage French prints from an 1846 French book. 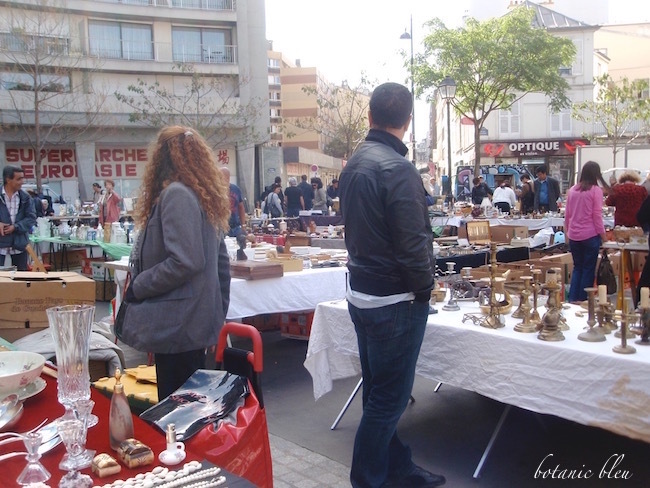 The prints came from a Paris brocante on Rue Cler this fall. 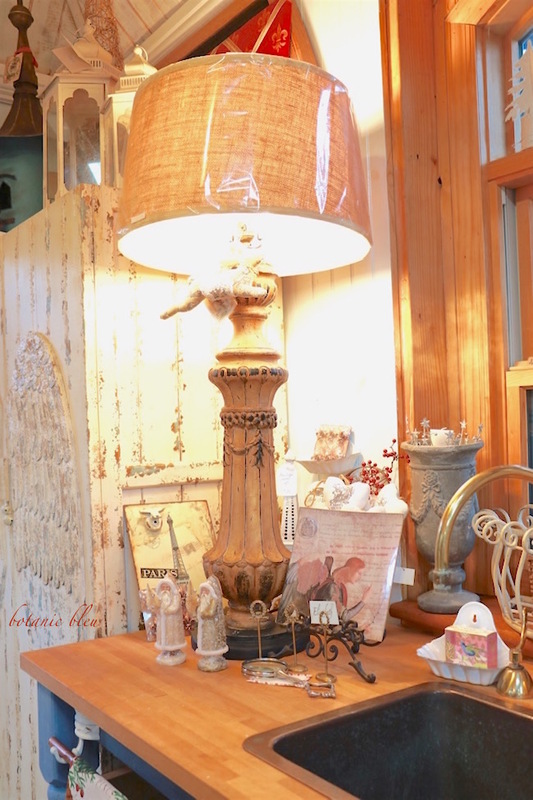 The other end of the sink counter holds a collection of French-designed items, including the large table lamp. 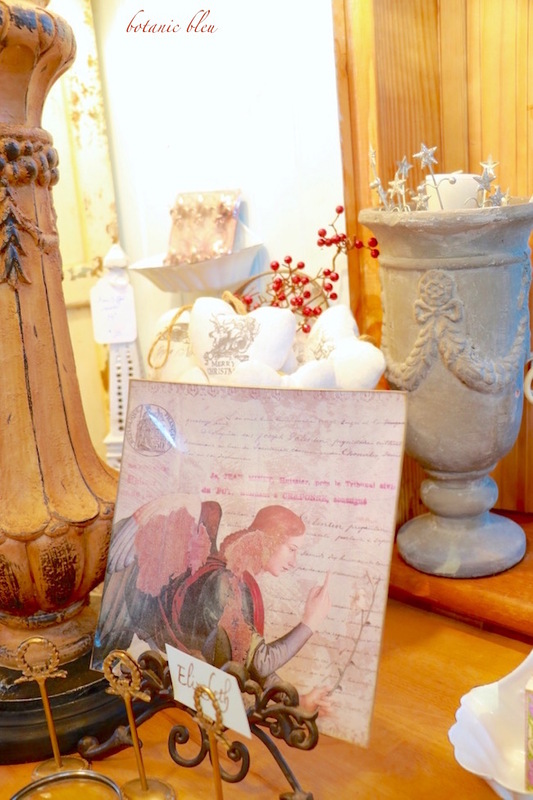 A French-style medieval angel glass plate is one of my favorite decorator Christmas plates. 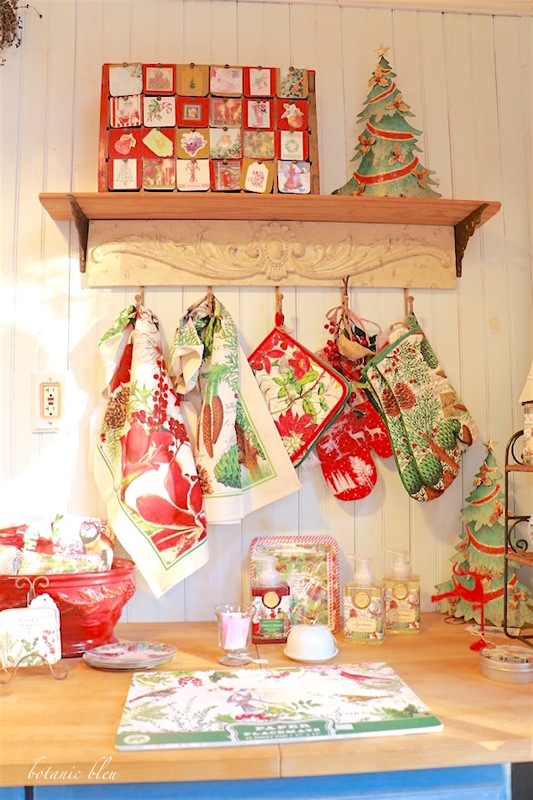 Finally, the fourth wall holds an old pine table and hutch filled with a variety of dishes, candles, bubble bath, and small items like gift tags and Joyeux Noel imprinted pencils. There is no way to show everything in the shop, but here are some close-ups of items. 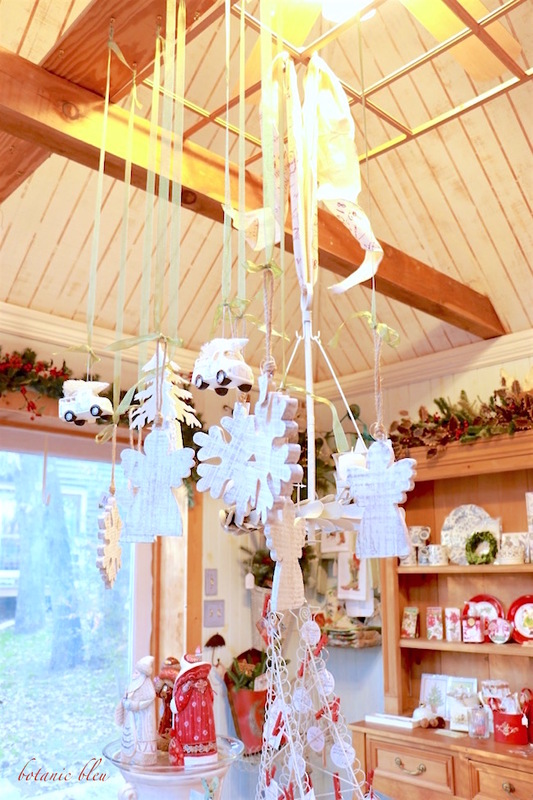 The garden shed shop is filled with Christmas inspiration. 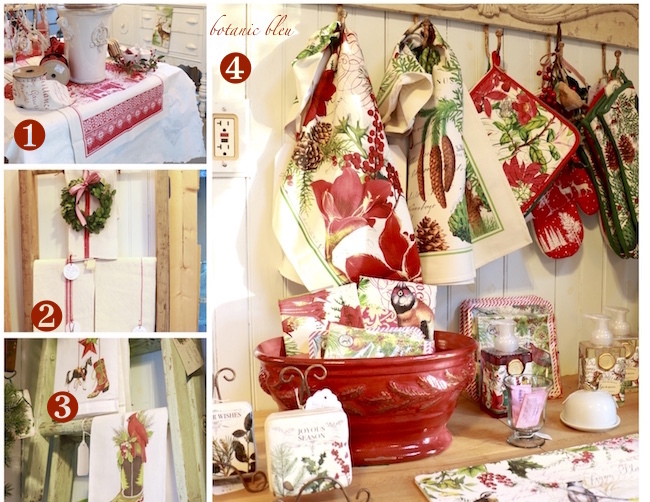 After Christmas some of these items will be available in my online Botanic Bleu Square shop. 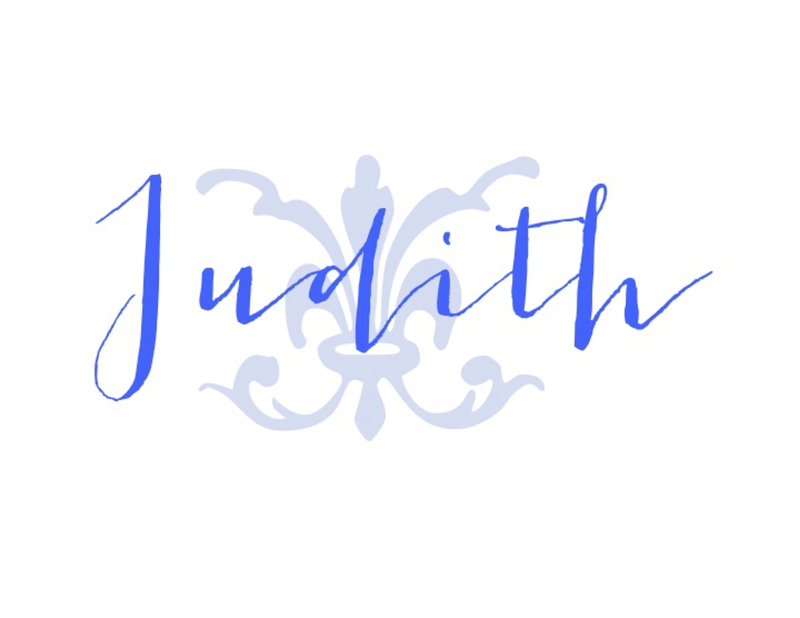 I will post when the online shop opens for orders. What is your favorite item in the shop? 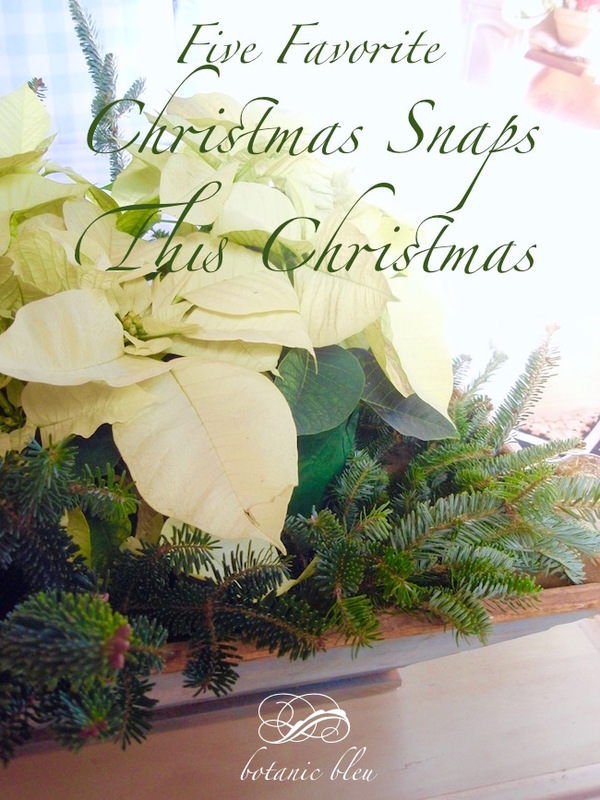 Looking for ways to add simple natural holiday decorations? 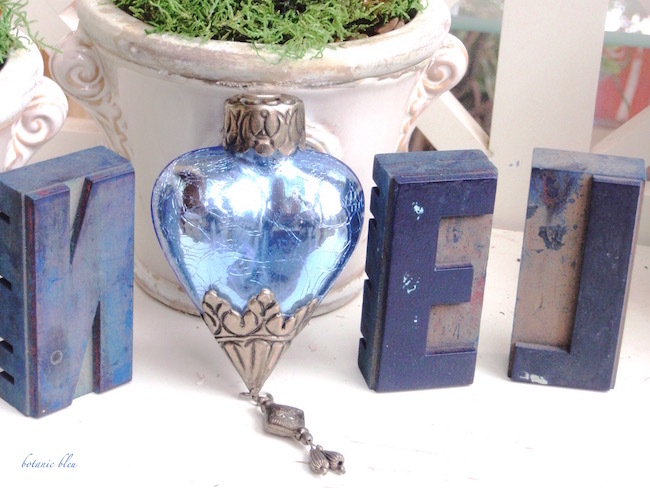 Perhaps to a porch, sunroom, or garden house? 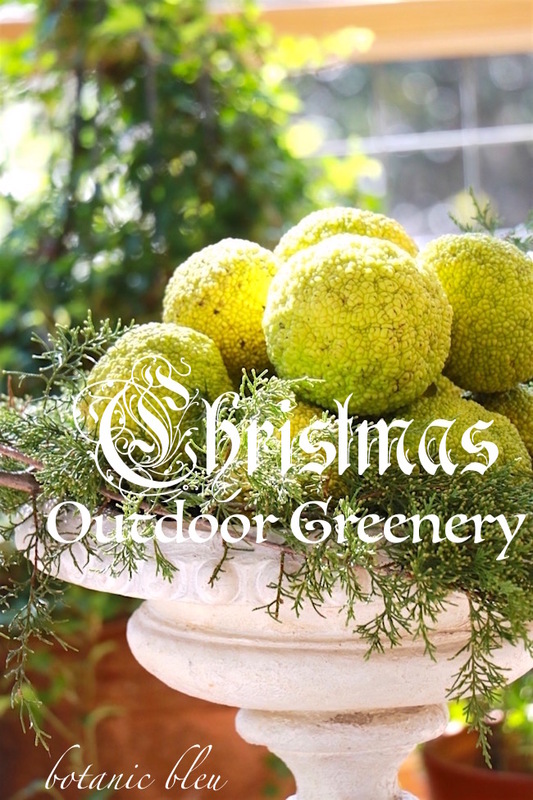 Something that blends with your existing plants, but gives a Christmas feel to the space? 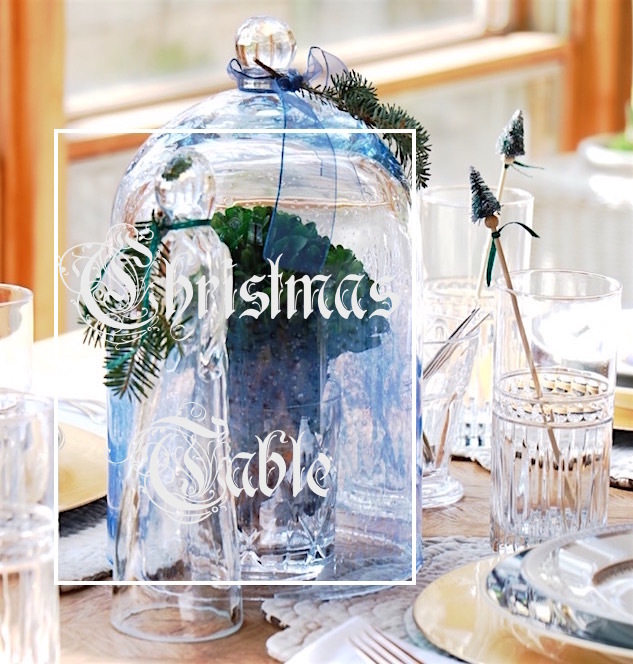 With the addition of one or two traditional Christmas themes and traditional Christmas greenery, an everyday collection of botanicals becomes a holiday table top. Being a teacher and then an school administrator meant that I always had a two-week vacation centered around Christmas. Since we lived away from both of our families, those two weeks made it possible for us either to go to see our families for several days or to have them come stay with us for several days. Christmas has always been a multi-day holiday which means several meals, not just one large holiday meal. Food is always the center of any holiday celebration at our house and probably at your house, too. One of our favorite desserts for Thanksgiving and Christmas is caramelized pears served with Blue Bell Homemade Vanilla Ice Cream. 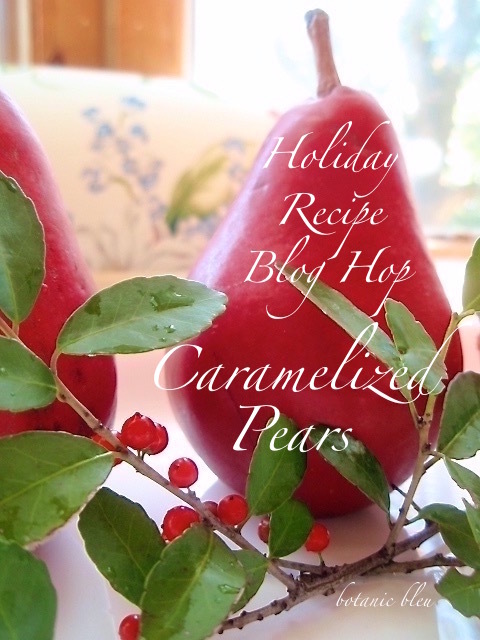 I discovered a recipe for caramelized pears from Williams and Sonoma about eight years ago, made a couple of changes to it, and now caramelized pears are part of our holiday traditions.